A Speedo in GTA IV. 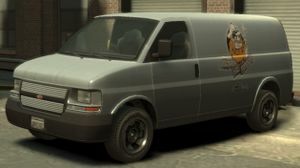 The Vapid Speedo is a windowless cargo van featured in Grand Theft Auto IV and Grand Theft Auto V.
Despite Vapid being GTA's rendition of Ford, the van resembles a 2003-present Chevrolet Express van but the front and back ends have been slightly altered. The badge on the rear reads Vapid ST. The Speedo features various company names, such as Deliver Me Timbers, Easy Lay Carpet, Hello Tailor and Nonna Pina's Restaurant. The vehicle is quite agile, thanks to its adapted suspension and weightless rear end. Powersliding is quite easy in this vehicle; however, in Liberty City's hilly terrain the Speedo is prone to bouncing about more frequently than other vehicles of its size. The engine is strong, powered by what feels like a high-torque V8 diesel in a rear-wheel drive layout; leading to acceptable acceleration and a reasonable top speed. Anti-lock brakes are an available option, but are not standard. The Speedo is, after the Burrito, the second-fastest vehicle in the "van" classification, attaining a maximum of 81 mph (130 km/h), but it is the most maneuverable. Advertisement for the Speedo commonly seen on billboards in the city. A black Speedo is shown in "Crime and Punishment" to contain TV screens that are otherwise not featured outside the mission. Although the van can be resprayed at a Pay 'n' Spray, it cannot be washed. A Speedo either plays Electro-Choc or Radio Broker by default when entered for the first time. Can be usually found in the East Hook docks. It can be commonly be found in the Acter Industrial Park and Port Tudor areas. This page was last modified on 23 December 2013, at 01:12.